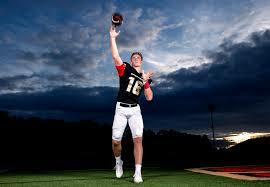 Davis Mills, Greater Atlanta Christian, QB 6’4” 198 lbs pounds. Davis was 23-of-31 for 336 yards and six TDs in a 42-14 victory over North Hall on Friday October 21, 2016. There were rumors of an injury to Mills just before the opening of the season that was to keep him out for months if not the season. Well, he has only missed two games and he looks to lead his #1 AAA ranked Spartans deep into the playoffs. He is the #5 rated pocket passer in the nation and has given his verbal to play football at Stanford.